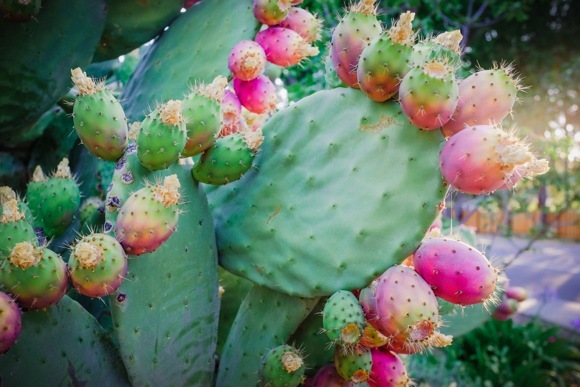 Editor’s note: Our chance encounter with a blooming prickly pear cactus on Middle Avenue in Menlo Park led to photographer Scott Loftesness stopping by to get new (and better) photos and then a visit with the plant’s owner Connie Pasqua. 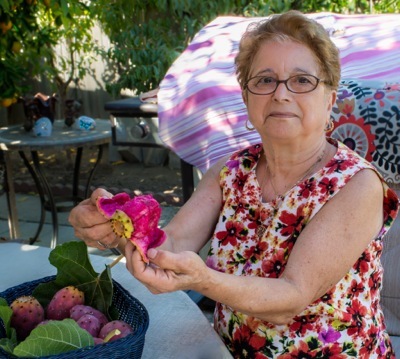 Talking with Menlo Park resident Connie Pasqua, we got answers to a number of our questions about her prickly pear cactus (Opuntia ficus-indica) that is currently in bloom. For one, if the City had had its way there would be no prickly pear. She also explained that the now almost 20-year-old plant is more visible this year because there used to be bushes in front of it that were removed five months ago.